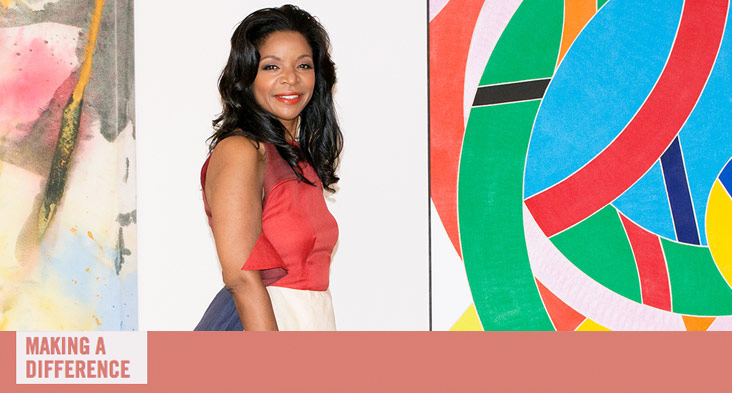 Arts philanthropist Pamela Joyner (MBA 1984) sees her own story in the African diaspora art that hangs on her walls. “I’m interested in ensuring that people like me are not erased from the narrative,” she says. Many of the artists that comprise her collection are enjoying increased visibility as museums such as the Tate Modern showcase their works. “There is power in abstract art, not merely as a stylistic mode, but as a personal choice for generations of African-American artists,” says the former member of the Obama administration’s Committee on the Arts and Humanities, who serves as a trustee for the J. Paul Getty Museum and the Art Institute of Chicago. Alongside a successful financial career, Joyner has collected objects ranging from abstract to figurative to 3-D sculpture made from 1945 to the present. Some 100 works from her collection are currently in a traveling exhibition titled “Solidary and Solitary,” which opened at the Ogden Museum of Southern Art, in New Orleans, in 2017, and will visit six other museums, including the Nasher Museum of Art at Duke University and the Berkeley Art Museum and Pacific Film Archive.